The Green Lantern mythos has never really been blessed with good villains. Up until Geoff Johns' work over the last few years, the Green Lantern Corps has always been the biggest disappointment in comics-dom, never living up to its full promise. Rather than massive interstellar battles, stories kept Hal Jordan earthbound, especially early on, dealing with goofy mutants like the rest of the superheroes. Case in point: The Shark. Nuclear radiation led to the mutation of a humanoid monster known as "The Shark." 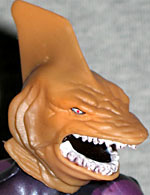 The Shark has increased intelligence and psionic powers as a result of this mutation, but retained his species' primal predatory cravings. He can survive on the psyches of enemies as well as their flesh. The Shark continues his sinister mutations evolving into a more vicious creature with every transformation he recently joined the reconstituted Secret Society of Supervillains for an attack on Atlantis. Like with everything else he's done with the GLC, Geoff Johns and artist Ethan van Scriver did a decent reboot of the character, really playing up his mutant-sharkness and making him a bit more of a frenzied beast. 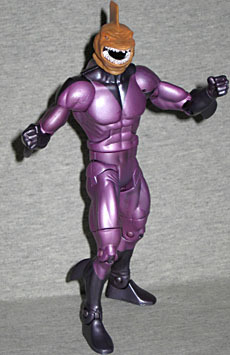 Fortunately, DC Direct honored that incarnation with an amazing figure a few years back. Now Mattel goes back in fills in with the more "classic" look. The base of the figure is the standard "medium male" figure used for characters like the Flash and the Atom. Uncharacteristically though, he offers not one but six extremities with unique sculpts! 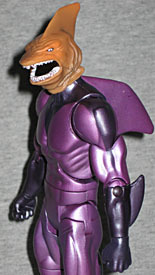 Of course the head is all new, as is the large dorsal fin on the back, but so are the forearms and calf pieces to boot. The calves in particular are very surprising to me because I just assumed they'd reuse Aquaman's legs, but The Shark's leg fins are more angled and smaller than Aq's. Plus they're on the outer sides of the calves rather than the middle. The head is a pretty decent sculpt with an "angry face." The head-fin is a bit more angular and with a blunter tip than I'd have preferred, and while the mouth being open is definitely a good choice, there is something kind of lifeless about it that looks slightly odd when the figure is just standing there. Articulation is the standard allotment, but I should note the head sports a return to the functional balljoint! Unfortunately, the sculpt on the back of the head goes lower than it could or probably should have and inhibits the figure from looking directly up. Still though, there is much more range here than on most DCU figures these days. The paint is pretty good too, a two-tone purple costume with the pattern painted on, rather than sculpted (as we've come to expect in the line) [hooray for lowered expectations! --ed.]. For the most part the paint lines are very clean, though the V on the chest is a little too soft-edged for comfort on this figure. The head is cast in a light orange but appears to be fully painted (as no light passes through it), another exciting new development for the line. There is a light brown spray for highlights and detail overall an "orange cream" base. The eyes are white with a black outer line and a red pupil - all surprisingly clean. The mouth has a shiny dark maroon interior with a light wash of the same color over the white teeth, which helps bring out the sculptural detail. Included are no accessories save but for the left leg of the Build-A-Figure Collect-N-Connect Kilowog. It's a very simple sculpt cast in green plastic with black paint for the costume. It stands up to the Shark's elbow, giving you a good sense of how big the guy will be once fully purchased. This is the kind of DCU figure that drives me a bit nuts. I look at him and wonder, "why do we have this instead of _______," but at least he's more interesting looking (the purple helps him stand out on the shelf) than that abomination Killer Moth and does help pad out our GL Rogues Gallery. I find The Shark to be the least desirable figure in DCU11, but he's worth getting to complete Kilowog, and does look better on the shelf rather than in a drawer (home of Killer Moth). In general this is arguably DCU at its best: a really simply character/figure executed well.